Beautiful Very Vivid Deep Blue-Purple Color on Genuine Tanzanite, Oval Cut, 2.33 carats An intense rich purple blue, excellent cut, clarity and life on this beautiful stone from Tanzania. Great saturation of color for the size, very bright. Tanzanite is a rich in color, elegant gemstone prized for its exquisite ultramarine blue-violet color think of the most vibrant intense lapis lazuli gemstones only transparent. The color has been described by the American Gem Trade Association (AGTA) as a mesmerizing blend of rich purples and blues with a velvety deepness of color unlike any other gem. In the late 1960s and early 1970s, thanks to the famous jewelry store Tiffany's, tanzanite became the darling of the gemstone world. Tanzanite is a member of the zoisite family which was first identified by gemologists around 1800. The tanzanite (blue zoisite) branch of the family was not identified until 1967. The pink, yellow and green members of the zoisite family never became widely popular as a gemstone and were typically used for carvings and trinkets. Tanzanite (trichroic zoisite - blue / purple / salmon) is a very rare gemstone in that to date top quality tanzanite is found exclusively in the relatively small Merelani Hills area near Mount Kilimanjaro. Gem quality tsavorite and chromium-green diopside are also found in the area. This is not surprising since it seems that tanzanite and tsavorite form under very similar conditions but a different depths in the earth. There have been more recent discoveries of a few inky blue gem zoisite specimens found in the Tsavo region of Kenya, an area known for its exceptional quality tsavorite (green grossular garnet). Those recent discoveries have so far amounted to just a few gemstones. How Tanzanite Got It's Name? 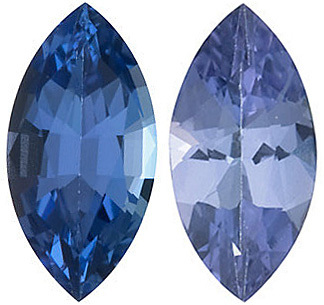 It is believed that Henry Platt, the grandson of Louis Comfort Tiffany said at the public unveiling of tanzanite by Tiffany's that tanzanite was "the most beautiful blue stone to be discovered in over 2000 years." It is also the only gemstone to be added to the Modern birthstone list since the list was first created in 1912. It joins turquoise and blue zircon as birthstones for those born in December. The history of the discovery of tanzanite is not simple. But one thing for sure, the fates or the alignment of the stars or destiny created a set of circumstances that ensured that tanzanite would be discovered and brought to the attention of the gemstone world hundreds or thousands of years after most gemstones used in jewelry had been discovered and identified. In the beginning - Legend says that exposed brown or brownish yellow zoisite crystals in the Merelani area were heated by the periodic lightning caused grass fires that swept through the arid uninhabited area. Some will have you believe the grass fires would not have been hot enough to heat the exposed zoisite crystals, but some grasses do burn at temperatures over 540 degrees Centigrade and that is sufficient enough to cause brown zoisite to color change to blue in only two or three minutes. Add to that that there were repeated fires and that part of the legend could very well be true. As stated, that area is arid and before 1967 was for all intent, uninhabited. It was occasionally visited by Masai herders passing through, but it seems they paid no attention to the beautiful blue stones. 1967 was the year the stars aligned or the fates stepped in or a series of coincidences just happened and blue zoisite was officially discovered. Most people will agree that Manuel de Sousa (1913 - 1969) was the very first to file a claim to mine blue zoisite. It is believed that he was the first to recognize the primary alluvial (loose, sitting on the surface) deposits of zoisite crystals at Merelani and the first to recognize the potential value. Mr. de Sousa was an immigrant from Goa, India. He supported his family as a tailor yet was a man who dreamed of treasure to be found and as such, was a part time prospector. The actual details of how he found the deposit will never be known as he apparently told slightly different versions of the story to different people. It is not unusual for a prospector to embellish the story a little every time it is retold so this is understandable. He was consistent in his story that he was lead to the area by men native to the area, men who had no interest in the stones and that he found transparent blue stones dancing in the morning sun when he arrived at the area to which they had led him. He was also consistent in his story that he thought at first that he had found huge blue sapphires. Having been a prospector for years, one of the first things he did was to test samples of his find for hardness and discovered they were too soft to be sapphire. Using his mineralogy book and experience as a prospector, he decided that olivine was the closest match. Olivine was a semi-precious gemstone that was profitable to mine. Consequently, he staked out four claims of 1,000 feet by 1700 feet and on he filed four mining claims for olivine with the Government Mines and Geology office on July 25, 1967* and he began mining in earnest. By April of 1968 the gemstone world had correctly identified the gemstones as blue zoisite (tanzanite) and Mr. de Sousa re-filed the same four claims but for zoisite instead of olivine. Word of Mr. de Sousa�'s mining claims spread like wild fire and soon the area was inundated by prospectors / miners. It is believed that at least 90 claims were staked in a 20-square mile area soon after Mr. de Sousa filed his claims. According to a quote from Michael Wolf, Tanzania-Zoisite Corp. (May 9, 1969 Life Magazine Tanzania to Tiffany) ,it's all so bloody maddening. In the gem business, everybody loses his reason. You aren't dealing with rational men. Like many discoverers of treasures, Mr. de Sousa had to deal with claim jumpers, workers that he hired stealing from him (he estimated they were stealing 80% to 90% of the gemstones) and then the guards he hired to stop the thefts were stealing from the workers and more. He seldom left his claims because of all this. Unfortunately, one time about 2 years after he filed his claims he left his claim and he lost his life in a car accident. It is interesting to note that due to many twists and turns of fate, government and other issues, none of the early zoisite claim holders managed to retain their rights. Samples of blue zoisite made their way to the Gemological Institute of America (GIA) and the Smithsonian through different channels and unrelated sources at almost exactly the same time in 1967. Two of the first people to present samples to the GIA and the Smithsonian were Campbell Bridges, a British consulting geologist for Tiffany and Company and Hyman Saul, Vice President of Saks Fifth Avenue, who obtained samples from his son, John Saul, PhD, Nairobi-based consulting geologist. At the same time as blue zoisite was being analyzed by the GIA, samples of this new gemstone had made their way to European gemology laboratories for analysis. Blue Zoisite samples were also presented to Henry Platt by Hyman Saul and Campbell Bridges at almost exactly the same time. Henry Platt was Vice President of Tiffany and Company and their chief gem buyer and it was Henry Platt that decided that Tiffany and Company should present blue zoisite to the world through a major marketing campaign. He felt that this beautiful new gemstone would not go over well if it was presented under its scientific name and he renamed it Tanzanite in honor of its country of origin. In 1969 Tiffany and Company introduced Tanzanite to the US and the world of beautiful gemstone jewelry. And the rush for Tanzanite was on and it very rapidly became one of the world's most popular gemstones. In 1971 the tanzanite mines were nationalized. Beginning in 1971 and continuing for 20 years, production from the mines was very low mostly because of the problems of open-pit mining, bad management and theft. By 1986 it was believed that there were as many of 30,000 itinerant miners who had dug narrow shafts and tunnels throughout the area in search of tanzanite veins. In 1990, the Tanzanian government stepped in to try to bring some order to the area. In 1998 and again in 2008, there was significant flooding with loss of life in the Tanzanite mines. In 2001 after 9/11, there was a temporary boycott of tanzanite by some jeweler in the US due to the incorrect belief that tanzanite was being used to finance terrorist operations. US intelligence agencies undertook extensive investigation into the issue and could find no evidence of Al-Queda involvement in tanzanite smuggling. In 2002, the Tuscon Tanzanite Protocol which established a tracking system for tanzanite was introduced to ensure conflict free tanzanites. Beginning in 2003, the government also instituted new safety regulations for the mines. Tanzanite prices have also had their ups and downs. Prices were relatively low during the 1970 because tanzanite was not available to a large market but zoomed upward when in the early 1980's tanzanite was exposed to a larger market. As supply and demand leveled out, so did the prices. In the mid 1980's prices peaked and started dropping to levels that were lower than when Tiffany's had first introduced Tanzanite and thereby creating a new gemstone star in the industry. Prices had a roller coaster ride that continued through the 1990's due to over mining followed by closing of the mines by the Tanzanian government in an effort to stabilize the price, flooding and other issues. Tanzanite prices in the new century have been on the increase in part because it is unknown how long mine production will continue. Some believe the mines will play out in 10 or 15 years, yet there have been new reserves discovered in recent years so mining may go on much longer. By Color, Cut, and Clarity. 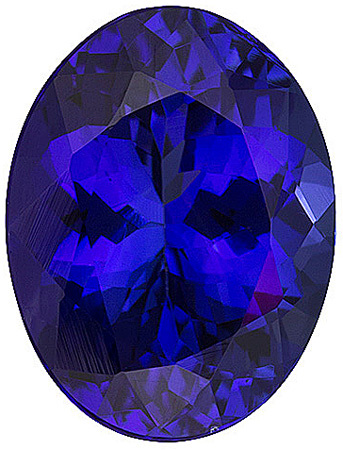 Tanzanite is a beautiful trichroic blue / purple / pinkish-red gemstone. An American geologist was quoted in the May 1969 Life Magazine article as saying There is a predominant blue which is richer than a sapphire, a purple nicer than an amethyst and a pinkish-salmon-brown which is described by both Europeans and Africans as flesh-colored. 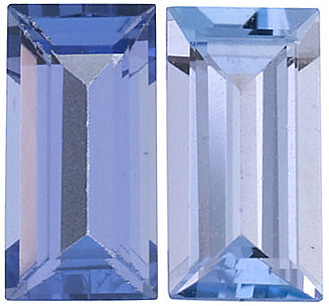 This change of color depending on angle of viewing is what makes the cutting of tanzanite critical. The gem cutter needs to make sure to cut each gemstone so it displays the most blue and violet (purple) color. 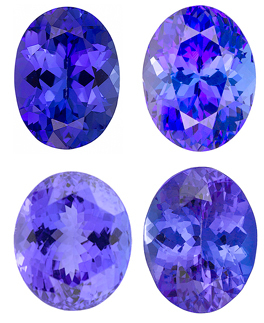 Hue The best quality tanzanite is blue / violet. 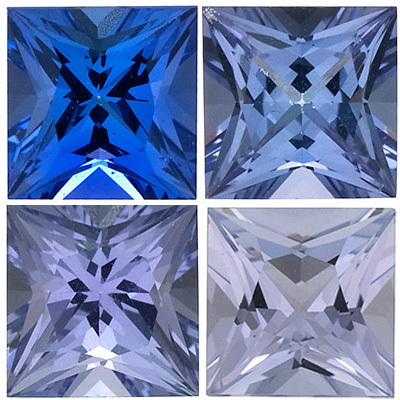 Some experts use a guideline of 85% to 90% blue (primary hue) to 10% to 15% violet secondary hue for the most desirable, expensive tanzanite. Light lavender with no secondary hue is the least expensive tanzanite. Using the GIA rating system, a ratio of 80% / 20% is probably the average for good tanzanite on the market today. 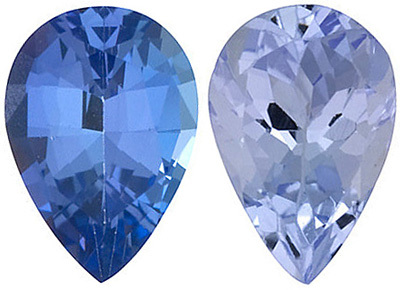 Tone The blue tone in a tanzanite should be between 75 and 80 percent to be ideal. 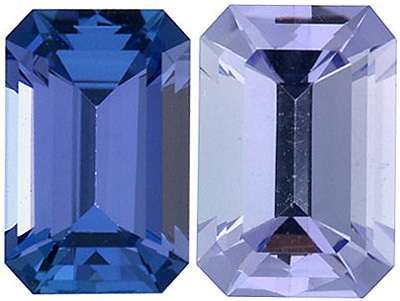 Tanzanite should not be too dark or too light in tone. If they are below 60% they will appear as a washed out lavender color and those with tone above 80% will be very dark. Saturation - Saturation ranges from "grayish / brown" to "vivid". Think of the word "intensity" when evaluating saturation. There are 6 levels of saturation. 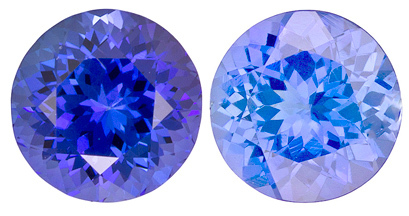 Most experts believe tanzanite should a bright vivid blue or blue / violet with little to no gray. Considering Buying a Tanzanite? A buyer who is considering the purchase of a loose tanzanite gemstone should request a professional gemological report in order to help them know exactly what they are purchasing. Grading reports may be shown using a numerical value and / or percent of color saturation and for the clarity and color - it will depend on with which laboratory the gemologist trained. There are several recognized laboratories like Gemological Institute of America (GIA - uses the numerical scale), International Gemological Institute (IGI), International Gem Society (IGS), European Gemological Center (EGC) and more. Clarity Tanzanite is a Type 1 gemstone and as such, it is graded very strictly. 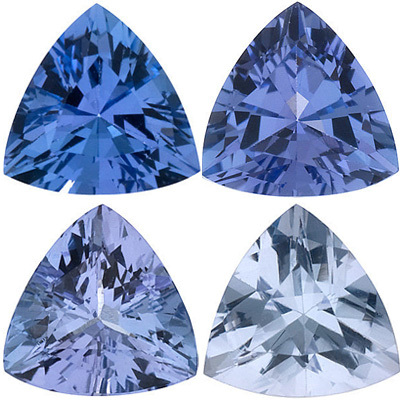 The best tanzanites are loupe clean or at the very least eye clean. Synthetics or imitations To date, tanzanite has not been created synthetically. The most common imitation is blue-violet glass. One of the best ways to determine if the tanzanite you are viewing is genuine or not is to look for the red flash phenomenon. When viewed in incandescent lighting, tanzanite will tend to sift its color to the violet hue and flash red and / or pink color. Enhancements Tanzanite is enhanced by heat-treatment which is permanent and stable. It is considered a natural enhancement that is a continuation of what Mother Nature started. 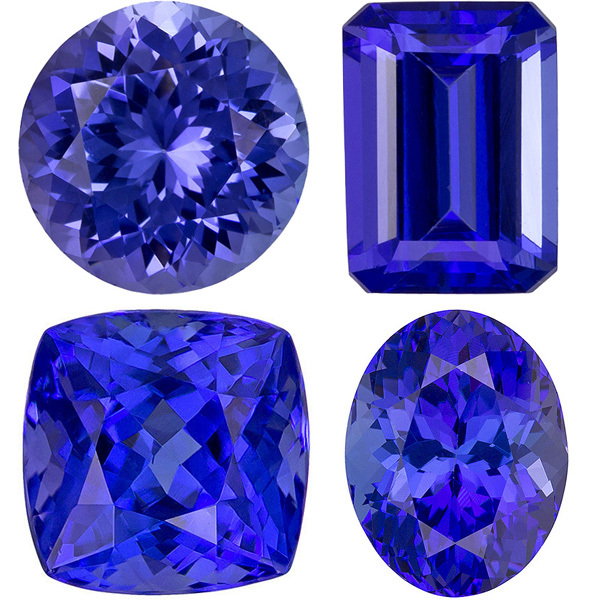 Durability - Tanzanite is 6 1/2 to 7 hardness on the Mohs scale so please take care to not just throw tanzanite jewelry loose into a jewelry box or don't wear while gardening or anywhere where it would be subject to hard knocks or scratching. Tanzanite is not as hard as sapphire and does require just a little more care.